Social Media and Internet Marketing Results with a KickStart! You need more Social Media and Internet Marketing results? Need a KickStart! for Your Marketing? You want some quick action and social media and internet marketing results you can see. You understand that the Secret Sauce for small business marketing is consistent contact over time with customers (and prospective customers), always aiming to extend your reach (more eyeballs on your business), deliver great value to serve your audience, stay top of mind (more credibility and “know+like+trust”), and get more customers and sales. This is the secret to social media and internet marketing results for your small business. RESULTS. KickStart! them! Accelerate your social media and internet marketing results with some quick and consistent action. Your primary job as a business owner is Marketing. Sometimes it’s what you avoid the most, put at the bottom of your daily action list, or use the shotgun method of scattering your marketing around without much of an idea about whether it’s hitting it’s target. You need the assistance of another pair of eyes and hands to decide what’s next and then come up with a plan of action and a guide. KickStart services are your guide to social media and internet marketing results. Add some rocket fuel to your small business marketing. Leaving uncertainty behind and choosing the best next steps for your marketing focus. Move forward with growing more visibility for your business with a short, easy learning curve and the confidence you need to meet your business goals. Accelerate your RESULTS with email marketing, social media marketing, and your website. 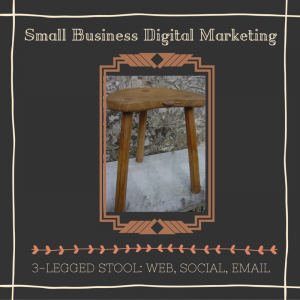 A quick overview of your marketing–website, social media or email. A 90-minute telephone consultation and follow-up written action plan. Suggestions for specific strategies that will increase your online visibility and your engagement with prospects and customers. Ideas about how to leverage your content and marketing and measure your results. A copy of one of our a “KickStart!” Guides and Workbook ($37 value). To explore our KickStart! packages, pick and click to see the details of the specific KickStart! that is your “get started” preference. The KickStart! My Website package includes a review of your business web site — design, content, navigation, copy PLUS social media and email marketing integration. Get confidently on the best use of your business website, increasing visibility and “find-ability”. Turn your website into a marketing hub and powerhouse. For more details, click to see KickStart! My Website Marketing. The KickStart! My Social Media package includes a review of your social media marketing–your social media profiles, content and engagement. You’ll be confidently on the right track with a plan and specific strategies that will increase your online presence, audience and and engagement with prospects and customers. You’ll be able to leverage your social networking time for better results. For more details, please visit KickStart! My Social Media Marketing. The KickStart! My Email package includes a review of your email marketing — your lead generation net, your email management set-up, email broadcasts (newsletters, business news, etc. ), content, and engagement. You’ll be confidently on the right track with a plan and specific strategies and steps to build your list, serve your audience with email marketing, and semi-automate your email marketing system to turn more of your leads into customers. For more details, see KickStart! My Email Marketing. Web Site KickStart! Social Media KickStart! Email KickStart! After you pay for your KickStart! Package, you’ll be taken to a form to fill out online. Submit the form and results are sent to us via email. Kate will contact you within two business days and we’ll begin the review of your site the same day we receive your payment and KickStart Basics form. Thanks! It’s great doing business with you: one small business to another! P.S. If the KickStart! is too basic for you and you’d like a more comprehensive review of your social media marketing, web site or email marketing, see our Digital Marketing 360 Package. Social Media and Digital Marketing Results with a KickStart! Focused Marketing Action with Social Media for Small Business LAUNCH!